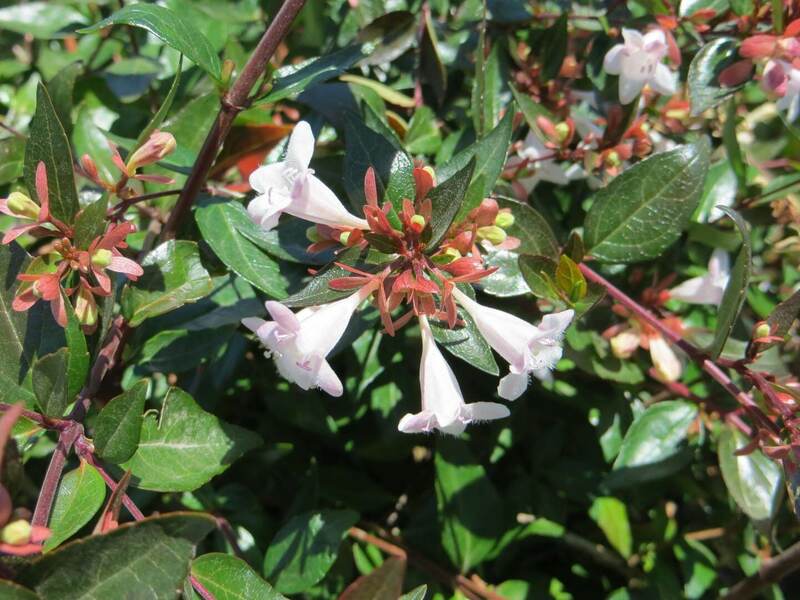 Named for Dr. Clark Abel, an early 19th century British doctor and horticulturalist, Abelia grandiflora or Glossy Abelia is an evergreen shrub hardy to 15°F and semi-evergreen below these temperatures. Given ideal conditions, including full sun to partial shade and regular water in well-drained soil, this popular shrub will exceed 8 feet in height and 5 feet in width, making it an ideal candidate for a lovely informal hedge or screen. The branches are clothed in glossy small green leaves that are initially bronze and may become bronze yet again with the autumn chill. A profusion of tube-shaped pink to white flowers appear in large clusters starting in the spring. As the petals drop, they leave bronze sepals that are attractive in their own right. It responds well to selective pruning and does beautifully in the sun but tolerates partial shade. Abelia grandiflora does well where deer are prevalent, in drought conditions, and on the coast. It will adapt to clay or damp soils as well. The flowers are fragrant and attract hummingbirds and butterflies.